This book presents the latest developments in protein bioinformatics, introducing for the first time cutting-edge research results alongside novel algorithmic and AI methods for the analysis of protein data. 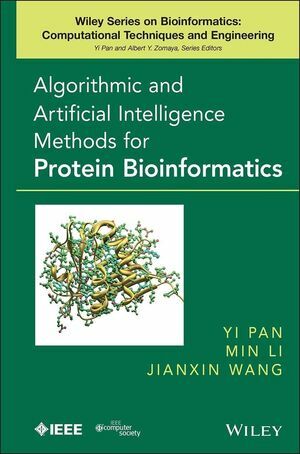 In one complete, self-contained volume, Algorithmic and Artificial Intelligence Methods for Protein Bioinformatics addresses key challenges facing both computer scientists and biologists, arming readers with tools and techniques for analyzing and interpreting protein data and solving a variety of biological problems. Algorithmic and Artificial Intelligence Methods for Protein Bioinformatics is an essential reference for bioinformatics specialists in research and industry, and for anyone wishing to better understand the rich field of protein bioinformatics. YI PAN, PhD, is the Chair and Full Professor in the Department of Computer Science at Georgia State University, and a Visiting Chair Professor in the School of Information Science and Engineering at Central South University in Changsha, China. MIN LI, PhD, is Associate Professor in the School of Information Science and Engineering and a postdoctoral associate in the State Key Laboratory of Medical Genetics at Central South University in Changsha, China. JIANXIN WANG, PhD, is Associate Dean and Full Professor in the School of Information Science and Engineering at Central South University in Changsha, China.